Pin this for later! Thumbnail image courtesy of Laura Barnes Photo. I’ve broken this blog post down into two parts. This post (part 1) focuses on the logistical side of getting everything in place, and PART 2 focuses on what happens the week-of the workshop and the day-of the workshop. Hosting workshops for any sort of art medium is definitely not a get-rich-quick scheme. It takes a lot of patience, detailed planning, and dedication to get everything sorted out and in place for the big day. The teaching is the fun part, but in order to get there you have to put the work in first. I’ve had experience hosting multiple in-person calligraphy workshops now during my full-time years of ElisaAnne Calligraphy. My first workshop was in May 2017 at Ambient Plus Studio in downtown Atlanta. I opened spots for 20 students (dang, I got super ambitious) and I ended up with 12 or 13 signups for the class, not bad right? That was my first lesson in the reality of selling out workshops is so. stinking. hard. Teaching for my first time was a wonderful and thrilling experience, but nothing could have prepared me for the work and investment that would go in beforehand. Let’s outline a few things you need to be prepared for when it comes to planning a workshop. 1. Put together education materials, such as a calligraphy student workbook. This is one of the hardest parts of the process, and can seemingly be the hardest to overcome. However, once you finish it, it’s done and can be used again and again. I’ve placed it as #1 for the process because there’s no point getting logistics in place for location, materials, etc. until you have a handle on what you’re actually teaching and something to give your students. I decided to design my workshop workbook in Adobe Illustrator, but I had to physically write out every single letter of the alphabet first and then scan it into Photoshop, where I digitized it before moving it over to Adobe Illustrator. I created all the guideline lines, written copy, and everything that my workbook includes. And I did it all from scratch because I didn’t have any resources or knowledge of what needed to go into a workbook! I essentially figured it out as I went. The process to create my calligraphy workshop workbook alone took me at least a month to complete. And once I completed it, it felt great! But it wasn’t an easy journey for me to get there, especially because I was nowhere near being proficient in Illustrator or Photoshop at that point. I later did the process for my Intermediate workbook, but it went much quicker that time around. For my beginner’s calligraphy class, my largest focus is on lowercase letters. I also provided my students with warm up shapes to practice in their workbook, as well as pages with full words and blank lines for additional practice. At the end of the workbook I put in a sheet with all the capital versions of the letters and numbers for if they wanted to practice calligraphy more at home. The first few pages of the workbook are all devoted to materials, nib types, paper, ink, etc. so that my students know where to go to purchase more items in the future after our class is over. I should note that I print my own workbooks from home! I outsource the cover to a printing company and clip it on later with a binder clip. I am currently in the process of revamping this workbook and (possibly) getting ready to license it to other creatives for hosting their own workshops. If you are interested in purchasing my beginner’s calligraphy student workbook so that you don’t have to create your own, please reach out to me at hello@elisaannecalligraphy.com. 2. Purchase ALL the calligraphy workshop materials & supplies you need for your students. Each workshop kit that I create contains at least a dozen different pieces: 2 nibs, 1 nib holder, 1 pencil, 1 brush pen, 1 pad of paper, 1 workbook (with clip), 1 inky-dip with ink, tissue paper for inside the box, 1 box for holding everything, ribbon to tie around the box, a sticker with my brand name for each box, and a little extra goodie for fun, like a notepad. 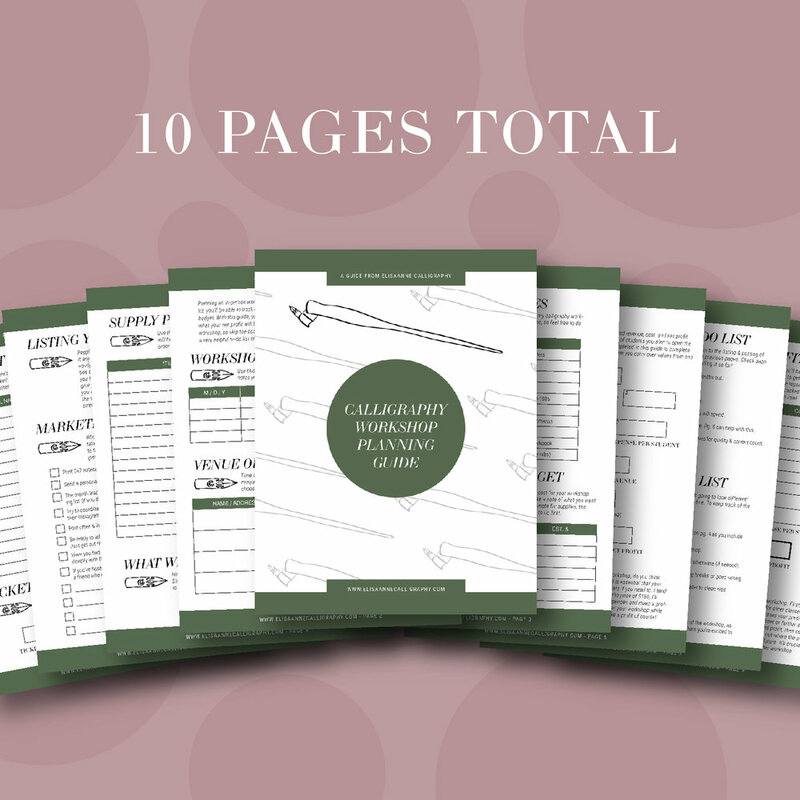 Take time to write out every single thing you will need in your workshop kit - or grab my handy-dandy Calligraphy Workshop Planning Guide to keep you organized and give you a head start. This planning guide includes all the places I purchase my workshop supplies & materials! The nibs need to either be prepped before the workshop or you can include a potato in each student’s kit so that they can learn to prep their own nibs! I’ve found the potato method is more fun and more surprising for students as well. Planning what you need for a workshop can be time consuming, as well as a dent on your wallet. I prefer to buy all my materials up front before a workshop. If the workshop doesn’t sell out (which is more common than not) then I carry those materials over to the next workshop. I’ll talk more about the marketing aspect later on in this post. I have certain online retailers now that I prefer to give my business to for my calligraphy workshops, specifically because they offer me certain discounts for buying in bulk. Whenever you can, try to purchase your products for a wholesale price because it will help you save so much money in the long run! You need to be a registered business to purchase wholesale. I use a cute white box to hold all of my materials for students, so that they have something to take everything home in at the end of the night. (Thank you Ashley Craft for this amazing idea & suggestion). If you want to know where I get these, the source will be in my Calligraphy Workshop Planning Guide. Don’t forget to factor in the fact that you will be paying shipping for every material that you order online. That’s an unexpected cost that a lot of people forget about when estimating costs! 3. Find a space to host the calligraphy workshop! Obviously there will be no workshop if you don’t find a space to host it ;) This part probably takes the most research and is the biggest investment, unless you can find a space for free or you’re hosting from your home, which is awesome and will make your life a little easier! For my first workshop I looked into multiple different locations, but decided on downtown Atlanta because I figured I would have the biggest reach in terms of finding people that wanted to attend. Definitely a good choice on my part. I paid $50 to hold my place at Ambient Plus Studio, but in the end I ended up paying a total of $375 for the space. Let’s do some quick math…. If I pay $375 for my space and charge $150 per ticket, then I need to sell at least 3 tickets to even make that money back. Already a lot of pressure! Recently I hosted a workshop where I paid $600 for the space, but that was an instance where I was hoping to have a lot more students for a wood signs workshop (it didn’t work out very well, but at least I can say I tried). Finding a space for a workshop is something you should be planning months in advance, since you need to make sure the venue actually has openings on the calendar! My favorite places to host have actually been small/local venues, such as Markay Gallery in Marietta, GA and Crazy Love Coffee House in Roswell, GA. I also love being able to support other small businesses! In terms of finding a local space for a workshop, the best thing you can do is start by asking around or maybe doing a “venue call” on Instagram! Ask your friends, family members, and followers for suggestions of local venues that would be a great place to host a workshop. This is how I found my favorite venue. Once you have the names of a few places, begin doing your research. Check their website for rental rates for an event. If they don’t have rental rates on their site, or they don’t even say whether or not they host events, then pick up the phone, call them, and ask! This is the best way to find out information you want. Sometimes all it comes down to is asking. 4. Determine a price for your workshop. I decided from the moment I started calligraphy workshops that I would never charge less than $150 per workshop seat. There’s a very specific reason for this: when I break down all the costs, I need to sell at least ½ the seats of a 12-seat workshop (so 6 total) to even break even on my expenses and generate income. Planning & hosting a workshop is not cheap. I am frankly baffled when I see people hosting workshops for $40, because there’s no way they can be making any money from doing that. And if you’re going to be adding workshops to your business model, then it is so important to actually be making a profit. I’ve had friends that have raised their prices over time, but I can assure you that the average calligraphy workshop will cost around $100-$200 for a two to three hour workshop. I’ve settled on hosting my workshops for 2 and a half hours. That seems to be the perfect amount of time for me to teach what I need to, and for my students to make their way through most of the workbook and ask me any questions they need to. 5. Create a way for people to purchase seats for your calligraphy workshop. No one is going to sign up for your workshop if you don’t have a way for them to pay! I usually put my workshops as a listing on my website, though I have seen people utilize Eventbrite for selling their tickets (some people do both). On my website listing I specific all of the details for the workshop, as well as making it very clear that I have a strict cancellation/no-show/no-refund policy. If someone cancels, it is their responsibility to sell the workshop ticket to a friend because I do not give refunds for tickets. Like I mentioned earlier, I buy all my materials for the workshop, and if someone cancels last-minute for a workshop that was full, that means someone else missed out on the chance to attend. I’ve been pretty good about enforcing this policy for all of my workshops, and most people have no problem finding someone else to attend in their place and pay them back for the price of the ticket. 6. Market the crap out of your calligraphy workshop (or whatever workshop you’re hosting). This section is an absolutely doozy. I do quite a few things to market a workshop. First of all, I print out little 5x7 notecards will all the workshop info on them. I carry these around with me everywhere I go and I hand them out to friends as well as local Marietta shops! Second, I send a personal email to about 20-30 local friends letting them know that I’ve scheduled a new calligraphy workshop. I ask them to forward it to anyone they think might be interested in the workshop. Third, I schedule multiple email campaigns to send out to my list. The tricky part about this is that most of my list is not local - however, I also ask them to forward the email if they have a friend local to GA that might want to come. Fourth, I try to coordinate with the venue to have some kind of collaborative marketing push. I usually ask to be included in their newsletter (if they have one) as well as getting some sort of post up on social media. Some venues I have had absolutely no luck with this tactic, which can be frustrating, but I’ve learned to let it go. If you want that tactic to work you really have to be on top of it and ask them for promotion as soon as you book with them! And make sure to follow up! Fifth, I post like a crazy person to social media. And omg this part gets to exhausting. I get tired of hearing myself talk about the workshop over and over and over. Sometimes friends will help me share info on Instagram as well. Sixth, be ready to talk to anyone & everyone that might be interested in the workshop. Keep a list of emails of people that have asked you in the past, “When will your next workshop be”? They are already warm leads and interested, so follow up with them to tell them that you’ve scheduled a new one! Seventh, reach out to past students to say that you loved having them at your past workshops and if they would like to attend another (or refer a friend that might want to attend), you have new dates added online. I’m sure there might be other examples I am forgetting here, but advertising and promoting a calligraphy workshop is no joke. It’s a very niche art and I have only sold out one workshop out of the 5 I’ve hosted through 2017-2018. Are you overwhelmed yet? Grab my Calligraphy Workshop Planning Guide to help you stay organized when planning your workshop! This is PART 1 of two blog posts. In PART 2 I’ll be talking about managing all the workshop to-do’s during the days leading up to, and the day-of, the workshop! Please drop any questions you have about hosting workshops below! I’d love to help you out!